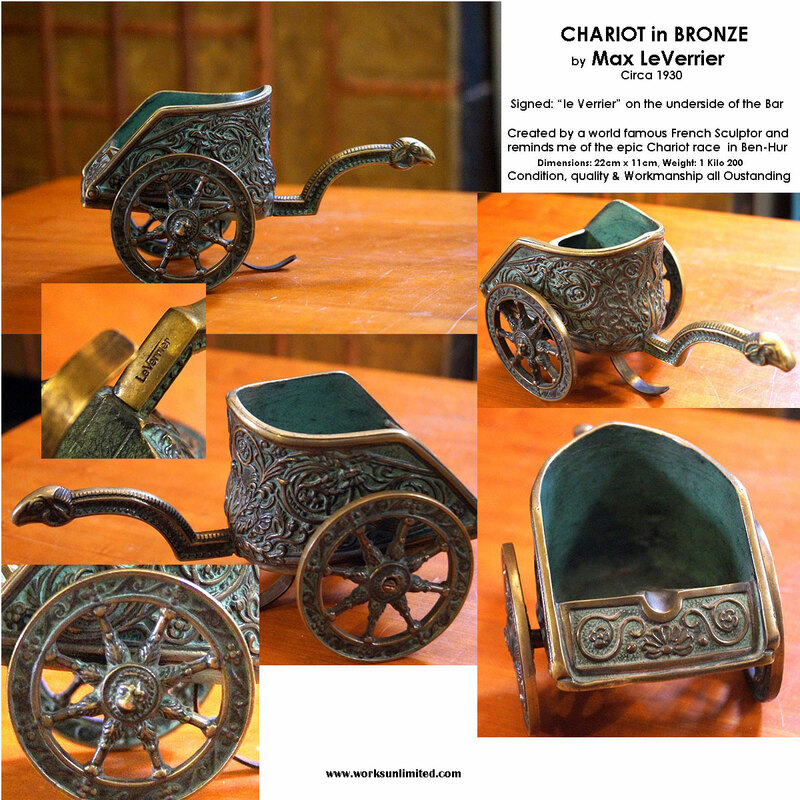 I decided to offer for Sale my extraordinary and rare Art Deco Antique WINE BOTTLE HOLDER/Cradle, truly a Work of Art, hand forged in solid Bronze with green patina and Dorée (gold gilt) from world famous French Sculptor, Max LeVerrier. Unsurpassed in Quality, Workmanship and Detail and impossible to completely describe. I have only seen 2 such examples in more than 30 years of collecting. Look closely at the larger Photo to see some of the Details, e.g. the knobnails on the Wheels to stop it from moving, the Lion Heads on the side of the Wheels, every cm of Bronze is Engraved, or Decorated in raised Relief. 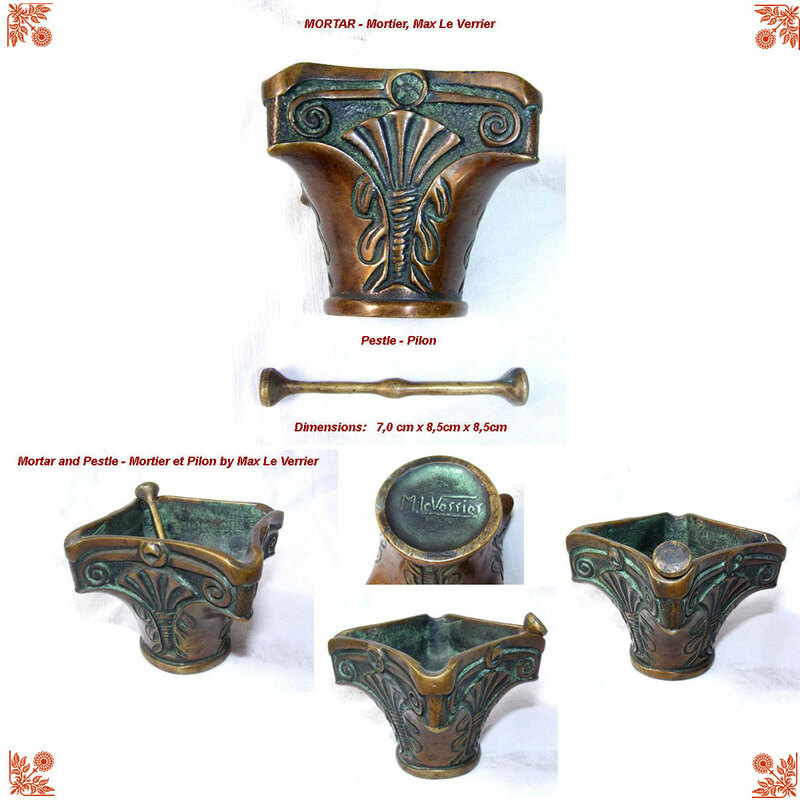 The HANDLE in itself is a work of art in Bronze. Wheels come apart & they Turn, Chariot rolls and reminds one of Ben Hur's Chariot. Design & Construction were 'Brilliant'. The Handle & the Cradle holding the Bottle comes apart from the Body of the Chariot so that you can Serve the Wine by lifting the Bottle from the Base. 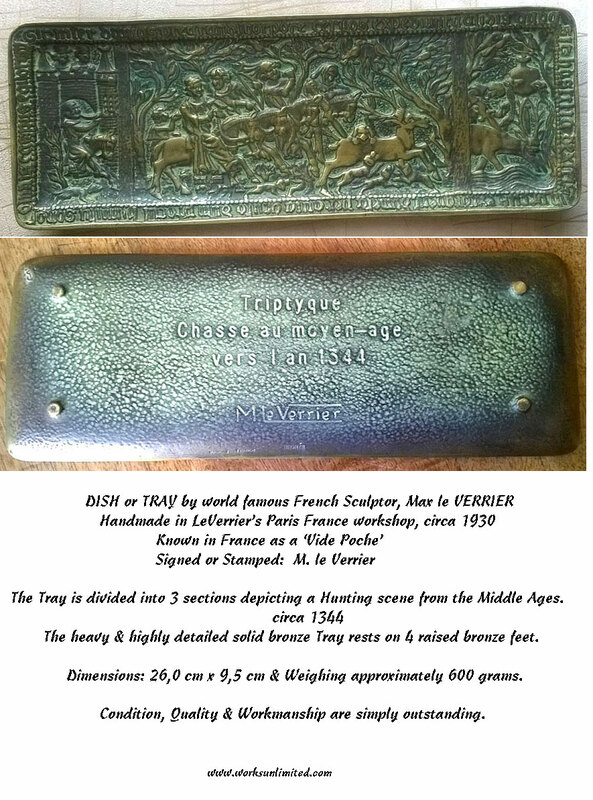 Created by Max le Verrier in his own Foundry and his Great Grandson in PARIS wrote to me confirming its Authenticity, Uniqueness and its RARITY! DIMENSIONS: 24,0cm Long x 19,0cm Tall x 14,0cm Wide and Weighs approx. 2.5 Kilos. 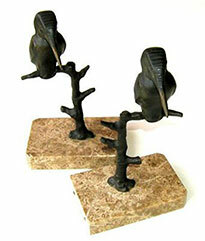 This Wine Bottle Holder is both Decorative and Practical as well as a Table Conversation Piece. 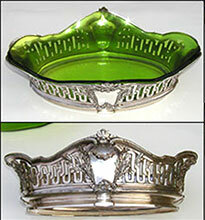 By comnparison, there is a Silver Plated Wine Carriage, Atkins Brothers for Sale @ $6,500. and I don't think it compares to this item. I have a short Biography on Max LeVerrier on my Daily Blog page. 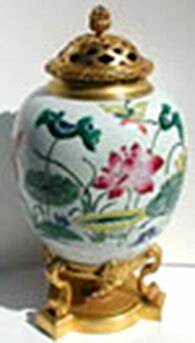 IMPORTANT Signed CHINESE PORCELAIN & ENAMEL & FRENCH ORMOLU POT, QING Dynasty. What a magnificent CENTERPIECE! Porcelain extremely fine and well decorated with water lillies, flowers, insects, butterflies, etc. 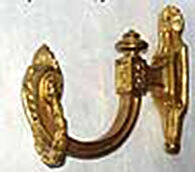 Ormolu is French and XIXth Century with 18th Century quality. 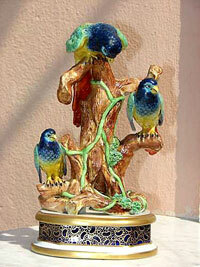 CONDITION, WORKMANSHIP & QUALITY including the Gilding are exceptional. 14.5" tall. RESERVED, Sale Pending to Paris Dealer. Etat irréprochable, proche du neuf. 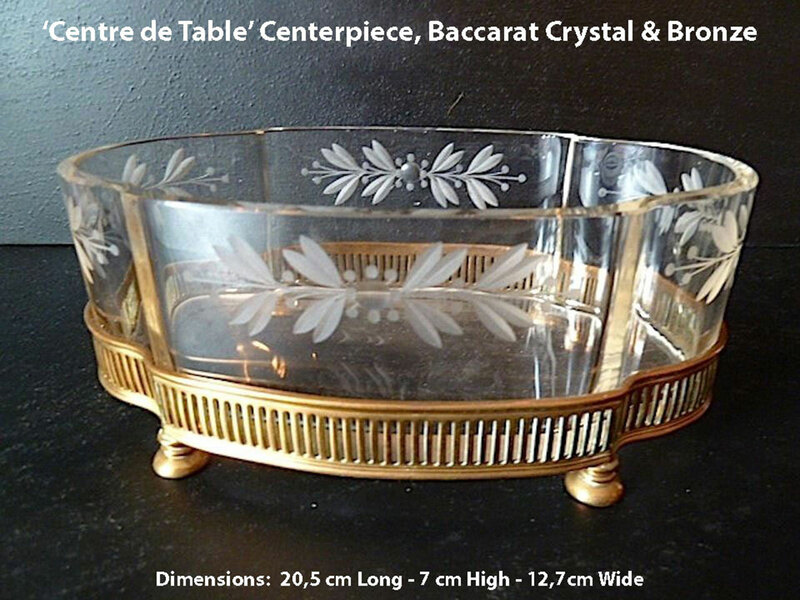 Centre de Table, Antique extraordinary Jardiniere Centerpiece with exceptionally heavy and thick Baccarat Crystal insert resting on a solid Bronze stand with 4 circular pedastil feet. No chips, no cracks, no repairs for an Antique more than 100 years young. The Baccarat acid etched Bowl is in itself, a work of art. 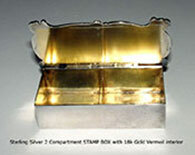 Note the Quality of the engraving, the thickness of the Crystal and the all over design. Use is for Fruit, for Flowers or just use your imgaination. CLICK on the Photos on any page on my Site for a larger Photo. Use it in the Kitchen, or anywhere, as Decoration on any Table, in an office, as a Paper Weight or on a Dining Room Table for Decoration with Candy or Chocoates inside and as a Conversation piece. on the famous Boulevard Malseherbes, Paris. 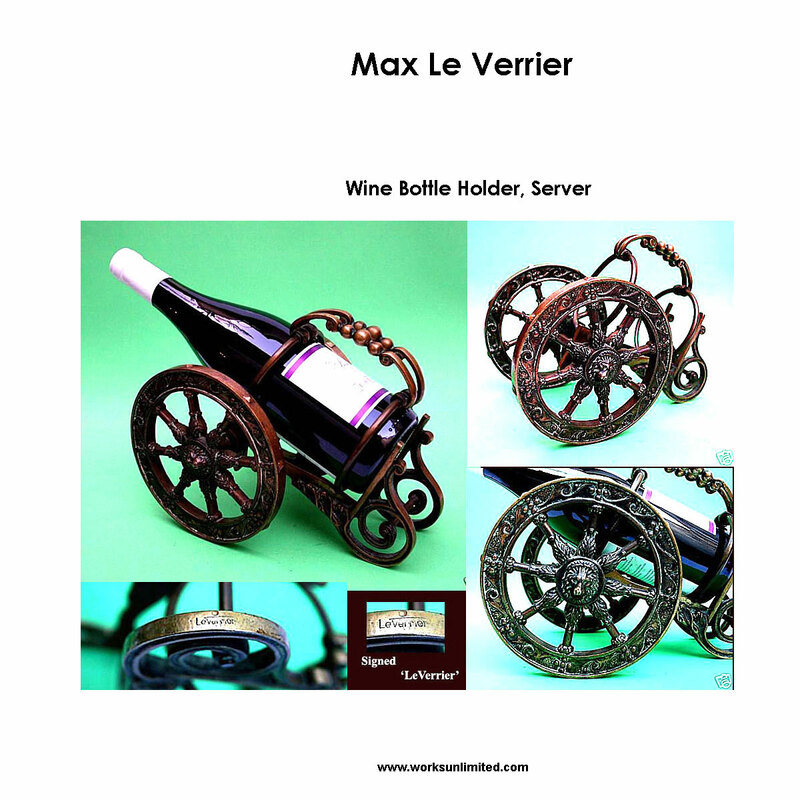 Ooffer for Sale is my extraordinary and rare Art Deco Antique WINE BOTTLE HOLDER, truly a Work of Art, hand forged in solid Bronze with brownish patina and from world famous French Sculptor, Max Le Verrier. Unsurpassed in Quality, Workmanship and Detail and impossible to completely describe. I have only seen 2 such examples in more than 30 years of collecting. Look closely at the larger Photo to see some of the Details, e.g. the knobnails on the Wheels to stop it from moving, the decorative coninuous design on the side of the Wheels, every cm of Bronze is Engraved, or Decorated in raised Relief. 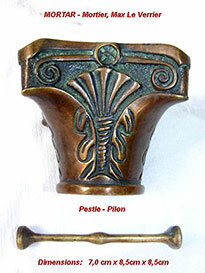 The HANDLE in itself is a work of art in Bronze with the Head of a Ram. 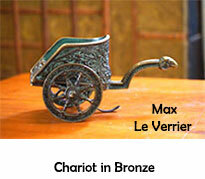 The Wheels and the Chariot are built to scale, the Chariot rolls and reminds one of Ben Hur's Chariot. Design & Construction were 'Brilliant'. The Wheels turn and the Chariot is built to scale. Designed to be used on a Table possibly for Decoration, or, instead of a Bottle place a Pot of Flowers as a Centerpiece, or, just use your imagination as it is very versatile. 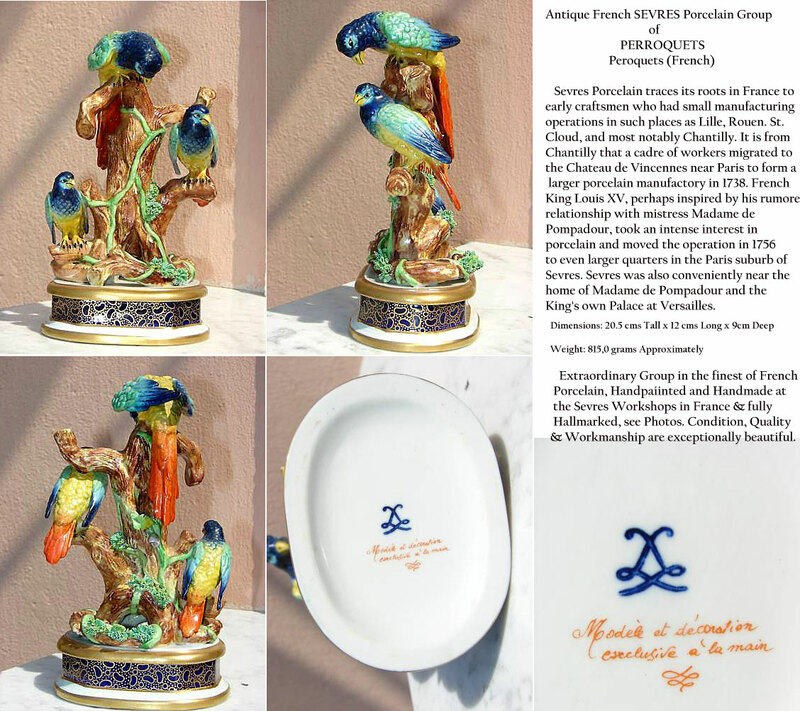 Created by Max le Verrier in his own Foundry and his Great Grandson in PARIS wrote to me confirming its Authenticity, Uniqueness and its RARITY! 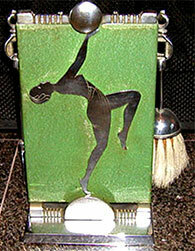 DIMENSIONS: 22,0cm Long x 11,0cm Wide x 11,0cm High and Weighs approx. 1.2 Kilos. This verssatile Flower Pot Holder, or Wine Bottle Holder is both Decorative and Practical as well as a Table Conversation Piece. 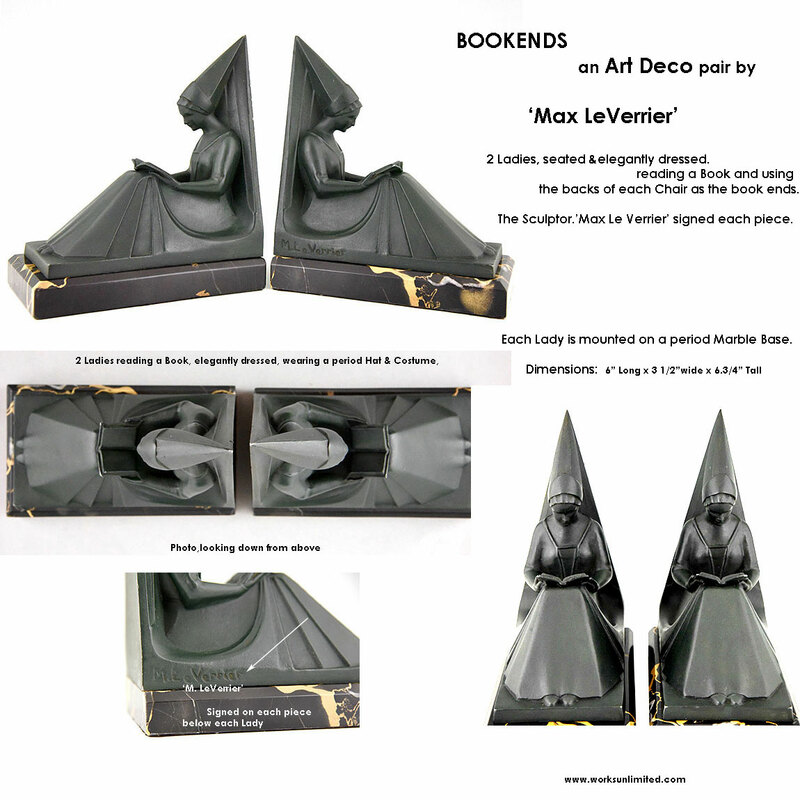 The Sculptor, Max LeVerrier is well known to me as I have collected his wide variety of Art Work for nearly 30 years. 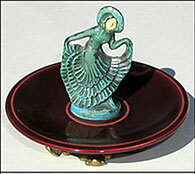 Match Box Holder & Striker, a unique one-of-a-kind examples, Antique and in outstandingly beautiful and colorful Cloisonné Enamel on Bronze with exquisite decoration. The 'Match Stiker' portion is on the inside of the Top. Dimensions: about 3.25" long at base x 2" wide at base x 1.5" high. 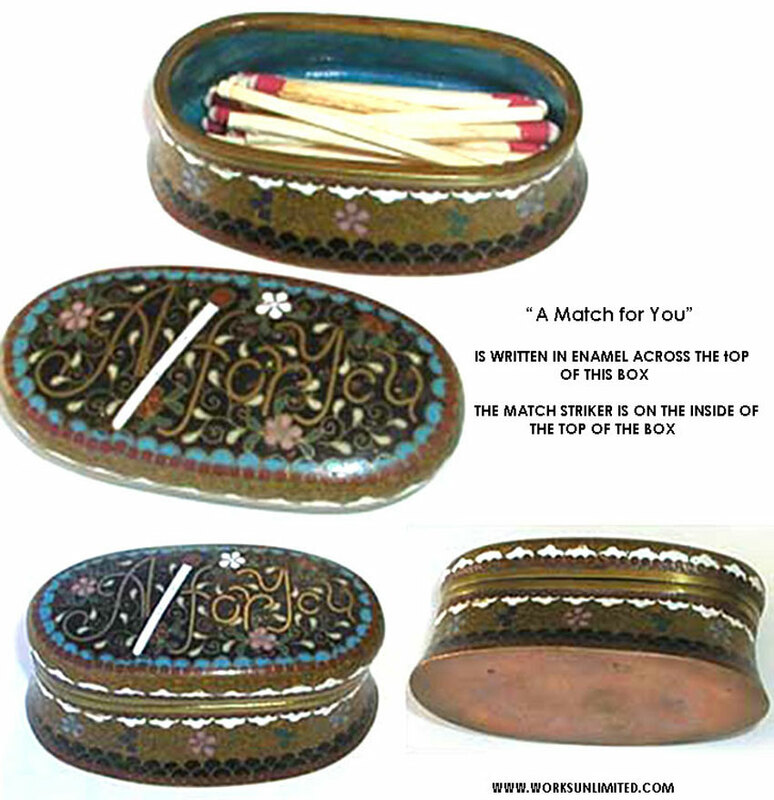 Top of the box has inscription: "A Match for You"
When have You seen another? I know that I haven't. A practical and most decorative conversation piece, put it on a Table or, in the Kitchen & use the Matches to Light your Candles. Large Heavy Bronze Desk Tay,"Triptyque" Dish sculpted by & signed "Max le Verrier" a world renowned French Sculptor. Divided into 3 separate scenes and parts, the overall Detail is quite extraordinary. Dimension: 9,5 cm wide x 26,0 cm Long and weighing a heavy 600 grams approximately. 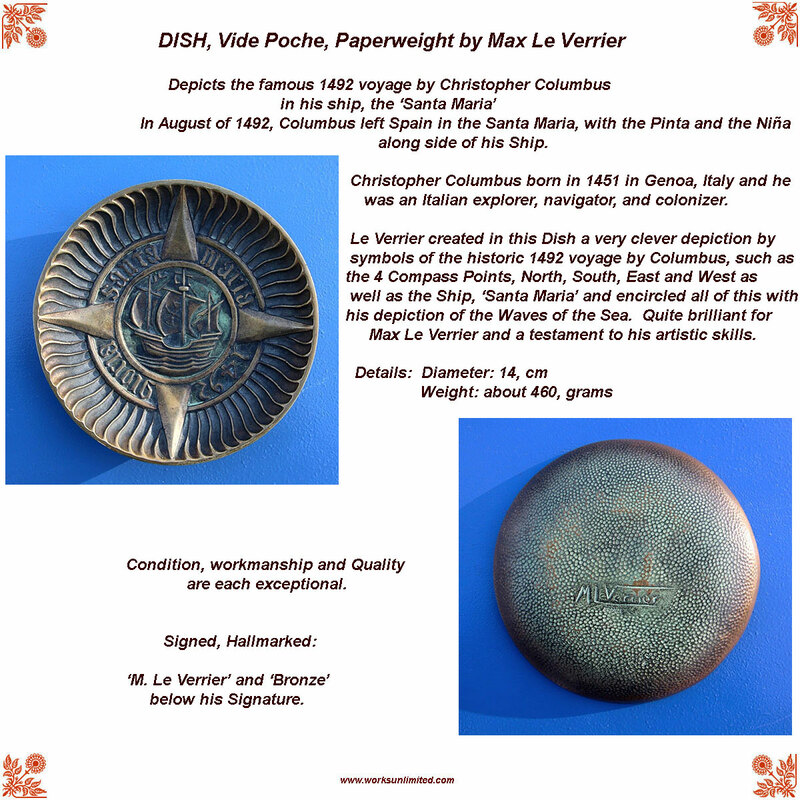 Examples by Max Le Verrier are often sold on eBay but, it is rare to find one of this quality, this size and weight. "CHASSE AU MOYEN AGE" is the Scene. This can be used for Pens, Pencils, almost anything including Service of Food. Note the Size of this Tray, it's feet etc. so as not to confuse it iwth the more common, smaller Trays and with no feet.. I have Photos of this Tray after a light polishing, if you ask. 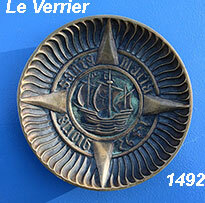 See eBay item #391514050533 for a small LeVerrier Clip @ US $395. 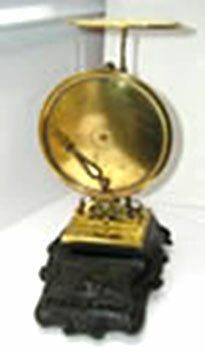 RARE 19th Century Desk model of a Postal Scale in complete original and working condition. 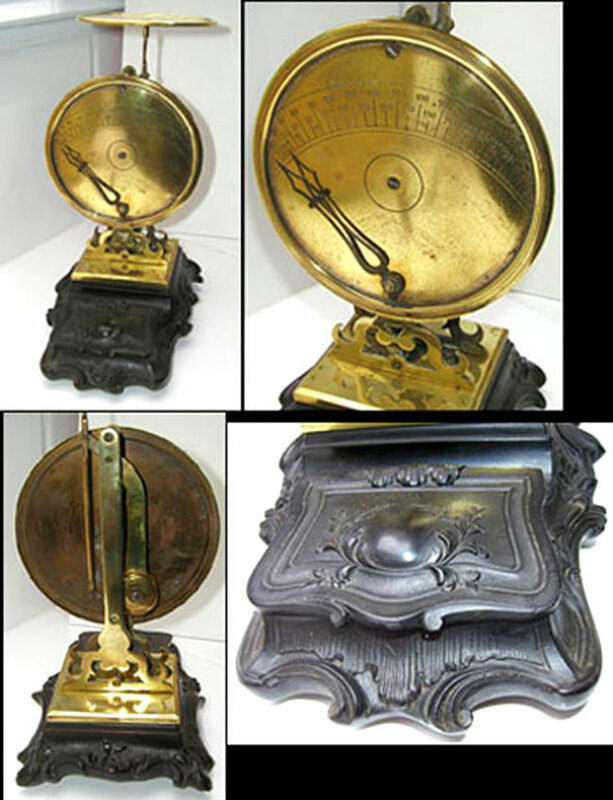 Click on photo to see workmanship and detail of the black ebony wood base and the decoration of the Bronze Scale. Ebony wood base has compartment to hold stamps and Scale rests on 4 scrolled feet carved out of the base. All of the gradations are intact. Dimensions: 9.5" tall x 7" deep x 5" wide. CONDITION, WORKMANSHIP & QUALITY are Exceptional. SEE another I sold on eBay under 'Items Sold' above, or below. 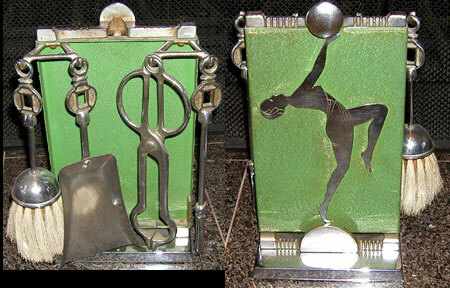 Fabulous HANDMADE 5pc Art Deco Fireplace Utensil set, Circa 1930's. Condition & Quality excellent with minor normal wear and in original condition with no replating. Dimensions: 11.75" high x 7.5" wide across the back. Includes 4 original utensils. Stoker, Shovel, Pinchers and Brush (hair set in wooden base). Beautiful detail on each utensil. Easily mistaken for a 'Demetre Chiparus' Design. Unsigned, but, very high quality nonetheless. 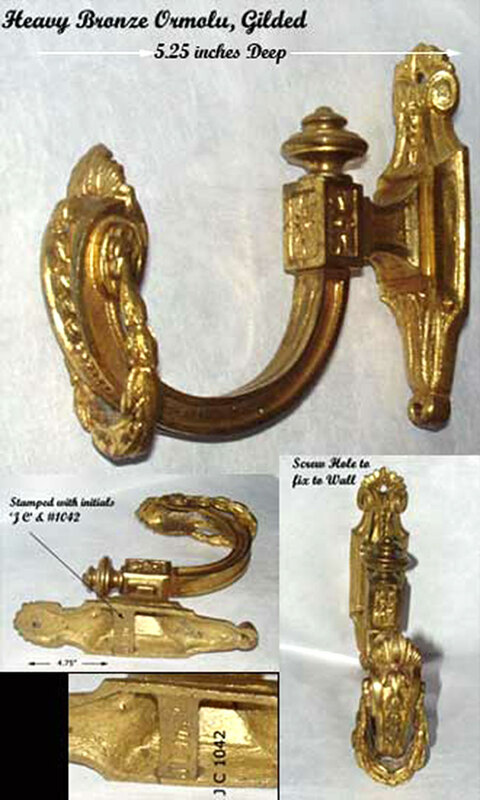 Fabulous Heavy Antique French Gilded Bronze Decorative HOOK used for Curtains, Drapes or Towel or Bathrobe or Coat Hanger. It is Hallmarked with initials "J C + #1042" (see Photos) Decoration overall is in Relief with outstanding Detailing The small Finial is removable and the quality & Detail of the Bronze and the overall design are outstanding. DIMENSIONS are 5.5" Long & Back is 4.75" Long. 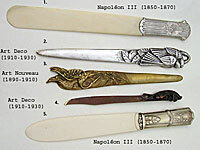 From a French Chateau in the Loire Valley, Circa NAPOLÉON III. French Silver Desk INK BLOTTER, Napoléon III Circa 1850-1870) or, "Buvard"
Antique French Bronze & heavily plated SILVER INK BLOTTER. or 'Buvard' is Decorated on each side with mystical faces, and lots of wonderful well detailed scrollwork. CONDITION, WORKMANSHIP & QUALITY are excellent. Dimensions: 5" long and about 3" wide. Comes apart in several pieces for cleaning and changing the Blotters. Use it also as a Paperweight. Please visit my Writing section for more Ink Blotters. 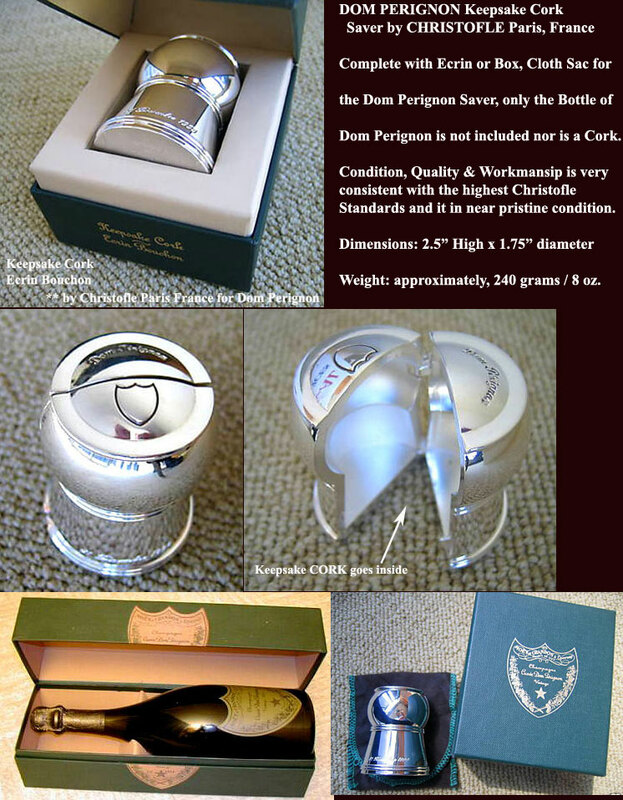 An incredibly beautiful, heavy, ingenious and practical way to Save the Cork of that Special Bottle of Champagne which recalls wonderful memories. 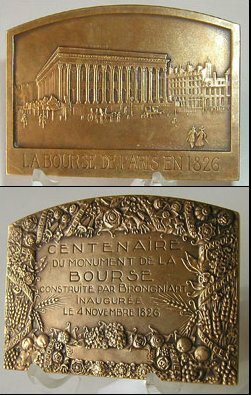 The workmanship of the Silversmith demonstrates the Quality this famous Parisian Firm of Silversmiths was capable of producing. 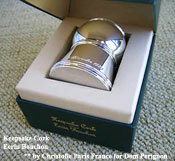 Handmade, with its Dom Perignon Pouch also comes with the Original Christofle Presentation Box for the Purchaser. What a fantastic Birthday or Anniversary Gift. CONDITION, WORKMANSHIP & QUALITY are Exceptional with only minor surface scraches. Sorry, Sold to Lorna, in Australia. 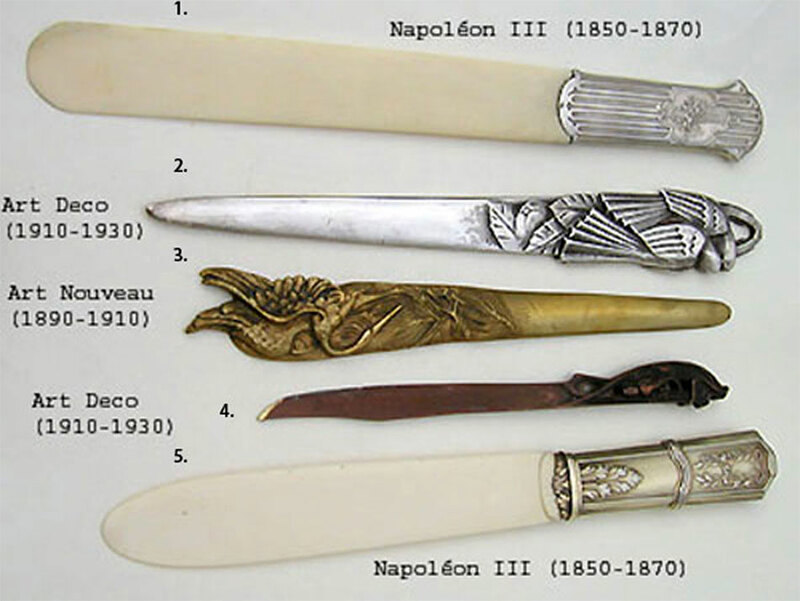 Here are 5 of my Letter Openers varying in Material and age. I have a collection of more than 50. Click the Photo to see all 5. CONDITION, WORKMANSHIP & QUALITY are exceptional. I do have other models available. 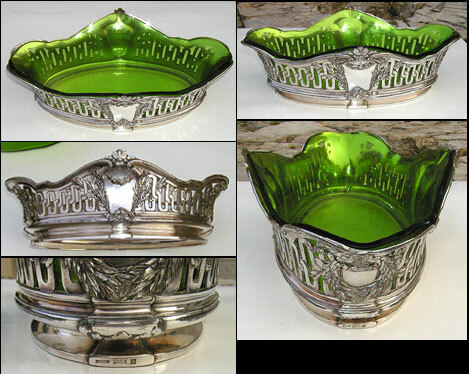 Antique plated Silver Jardiniere or Centerpiece with original green glass liner. It was made circa 1930. Came from a French Chateau in the Loire Valley, France. Dimensions: 13.5" Long x 4.5" High. Condition & Quality are very good with minor chips on the top of the glass liner. Created by Christofle at a time when Christofle was not mass producing and their artisans had the time to create a work of Art. The Silver Bowl is marked Gallia which was reserved for the more Avant Garde design range of Christofle and makes it that much more desirable. Exquisitely decorated Napoleon III bronze/ormolu gilded with porcelain ink well. CONDITION, WORKMANSHIP & QUALITY are outstanding. Dimensions, about 6.25" long x 2.5" high. Shell motif, decorated all over. 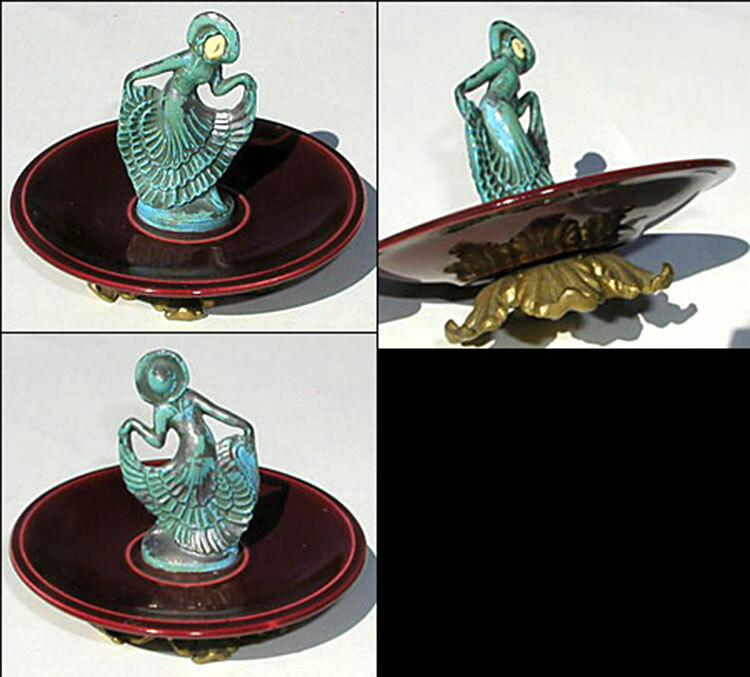 Exquisite Art Deco Card Tray or Vide Poche (change tray) in beautiful French Enamel and Gold metal. There is some cracquelure on the Dancer and her face is Ivory I believe. CONDITION, WORKMANSHIP & QUALITY are excellent. Dimensions: 4.75" wide x 4" high. ANTIQUE XIXth Century Hand made Stamp Box in cross-banded wood marquetry and in very good condition with normal usage wear. 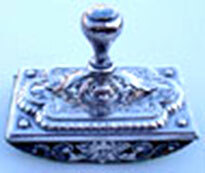 The Hinges like the Stamp Box were Hand Made and are engraved with decoration. There are 4 compartments for stamps and the inside of the Box has been Lacquered, black. Imagine the amount of labor involved in making a tiny Box like this in Marquetry, a labor of love; France did not have 35hrs/week! Length 6", Width 2 3/8" and Height 1.5"
Elegant, decorative, practical Sterling Silver Stamp Box, 2 compartments with 18k Gold Vermeil interior. CONDITION, WORKMANSHIP & QUALITY are excellent. Hallmarked on the bottom: "Sterling + B2163 + 3 unreadable marks" Dimensions: 2 7/8" x 1.5" across the top. 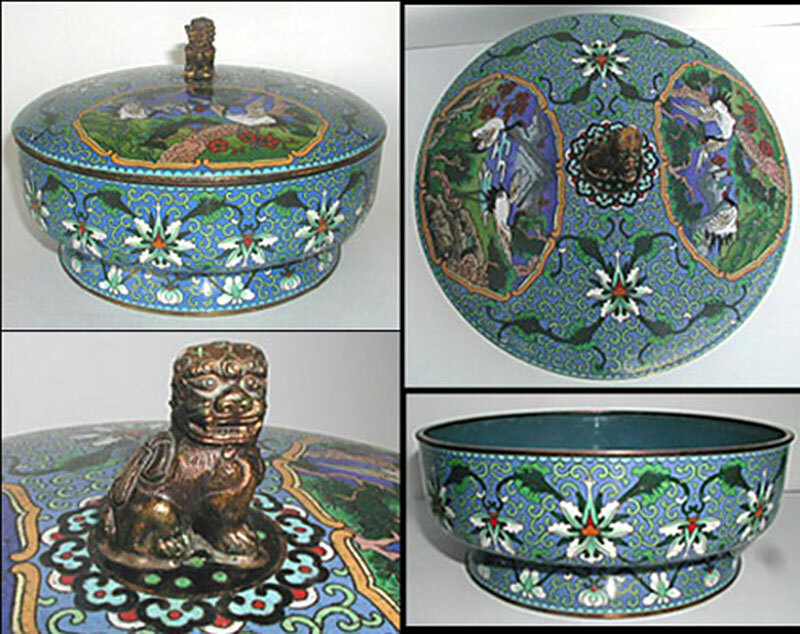 Large Antique Cloisonné covered bowl in beautifully decorated multi colored enamels. Inlaid in richly hued enamels, decorated with colorful floral patterns against a deep turquoise background. The exposed edges and base are finished in Gilt metal.The cover is decorated with 2 mountainous landscapes with cranes--the 2 scenes are joined by the same floral patterns from the bottom part of the bowl. 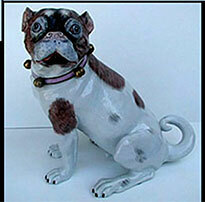 Sitting majestically on the top of the cover is a solid Bronze 'Fu Dog' Finial, protecting the Bowl and its contents. Condition and Quality are excellent. Enamel is in fine condition, some minor pitting. 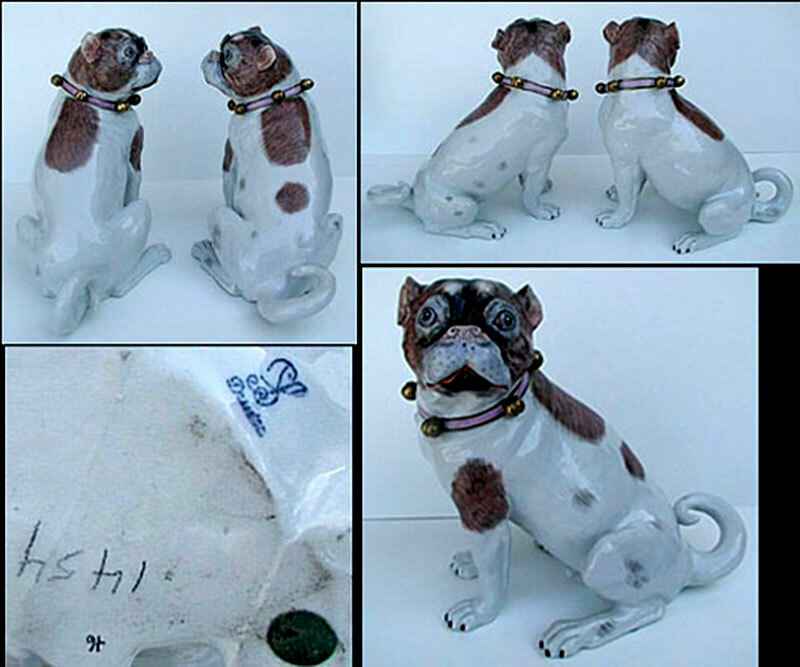 Dimensions: 8.25" in diameter and 5.5" tall to Fu Dog. 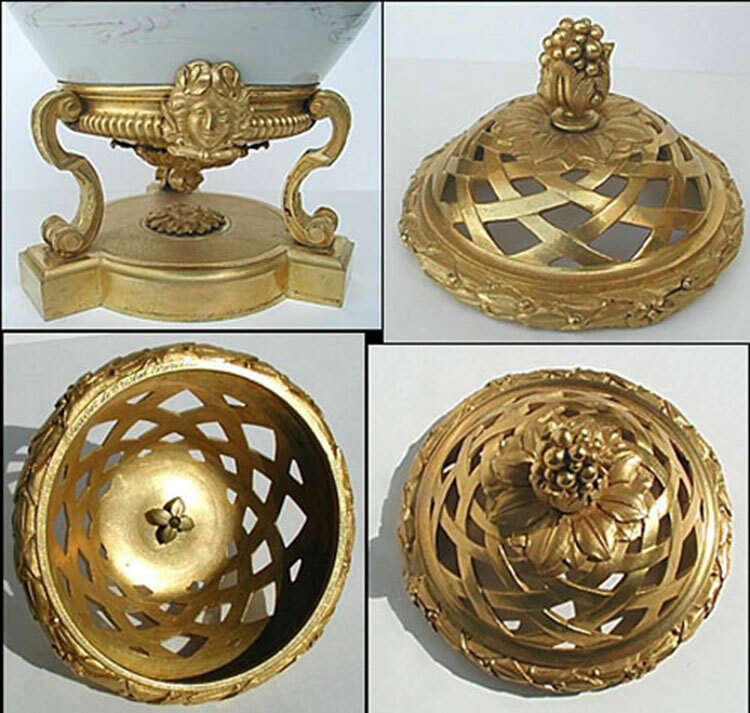 Rare Antique Menu, Flower Pot & Match Holder in fine Paris Porcelain with Gold Leaf gilding. CONDITION, WORKMANSHIP & QUALITY are excellent. 6.25" tall x 4"deep x 4". Designed so that Menu can be written and erased and Flowers placed for decoration. 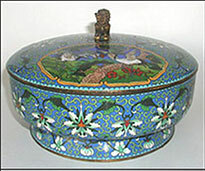 Matches were placed in the small bowl and side could serve as striker. 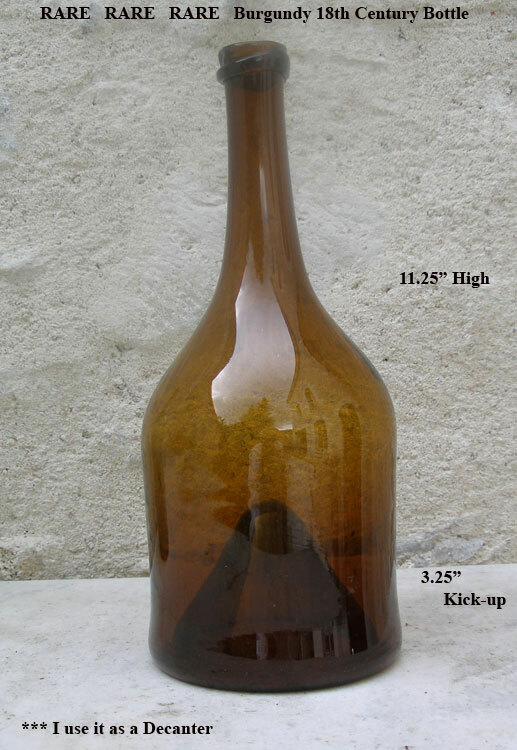 An extremely fine Hand Blown French Bottle Circa 1700's for WINE or, you can use it for Cognac, Calvados, Armagnac etc. Color is beautiful with tiny Bubbles appearing throughout. Base has an incredibly deep kick-up of about 2". 'Pontil' Clean, round & smooth, NO chips, nicks or cracks except minor defects from origin. Bottom is clean and smooth and the Kick-up is rounded inside and more rounded outside. Fill it with your favorite Vintage Cognac, Armagnac, Calvados or Wine & see the difference it makes on a Table. CONDITION, WORKMANSHIP & QUALITY are exceptional considering its Age & use. DIMENSIONS 11 1/8" Tall with Base Diameter of about 3.25". 18th Century BURGUNDY WINE BOTTLE, DECANTER, Circa 1725 Simply, Impossible to find! 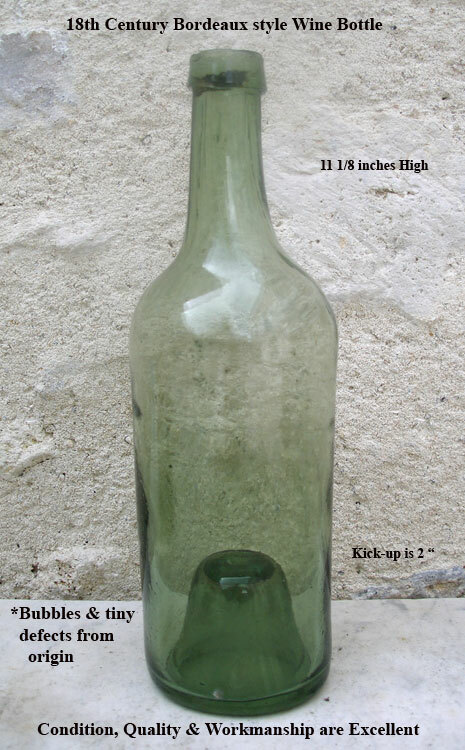 An extra fine Handblown French Burgundy Wine BOTTLE which I have decided to Sell. Light as a feather, about 155grams. Consider that an average empty wine bottle will weigh about 400-500g. Very tiny Bubbles appear throughout. Base has an incredibly deep kick-up of about 3.25". 'Pontil' rough from being Handblown and then cut, NO chips, nicks or cracks. Color is a light Green/Brown. Bottom is clean and smooth. 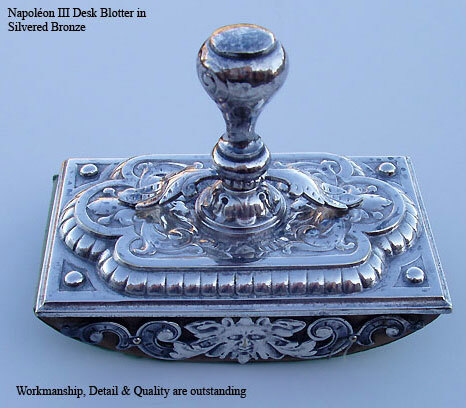 CONDITION, WORKMANSHIP & QUALITY are exceptional considering it is over 250 years OLD. DIMENSIONS 11.25" Tall with Base Diameter of about 4.75". Very light in weight but wonderful in the Hand. Consider the Price today of a good bottle of Wine. WHEN have you ever seen an 18th Century Burgogne Bottle anything like this one? One sees immediately where the Silversmith and Vigneron created the Ombilic Wine Taster which dates from the same period. This is an Historic Work of Art in Glass! 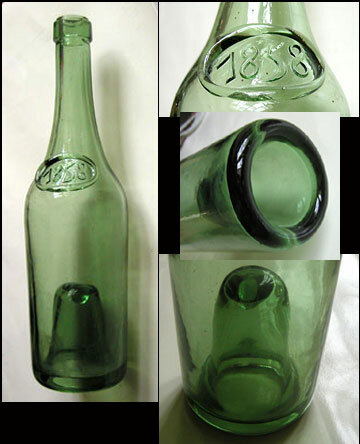 An extremely fine Hand Blown French Seal Bottle Dated '1858'. 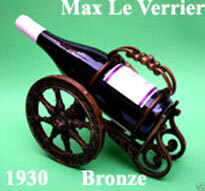 For Cognac or Wine this bottle was possibly blown later to hold an 1858 Vintage of Wine, Cognac or Calvados. Color is beautiful with tiny Bubbles appearing throughout. Base has an incredibly deep kick-up of about 3". 'Pontil' Clean, round & smooth, NO chips, nicks or cracks. Color is a Mediteranean Green. Bottom is clean and smooth. 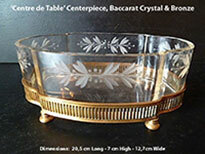 Fill it with your favorite Vintage Cognac, Armagnac, Calvados or Wine & see the difference it makes on a Table. CONDITION, WORKMANSHIP & QUALITY are exceptional. DIMENSIONS 12.25" Tall with Base Diameter of about 3.25". Compare with item #6157125874. 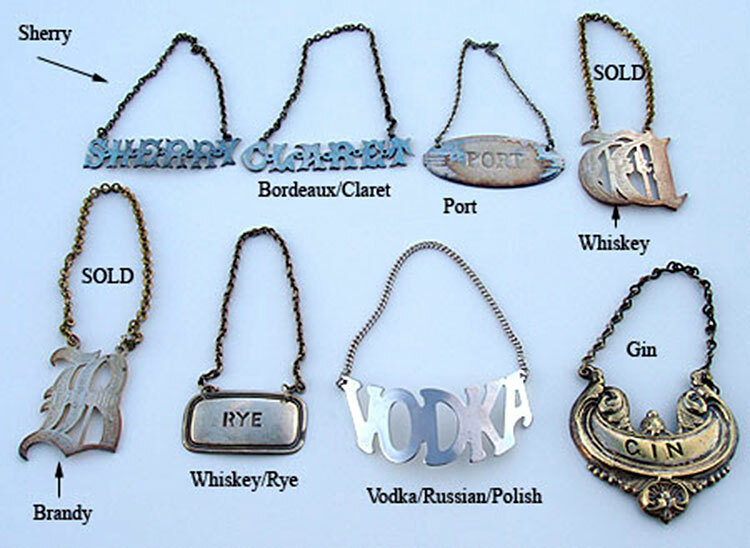 A small assortment of Labels for WINE, ALCOHOL and DECANTERS in Silver. 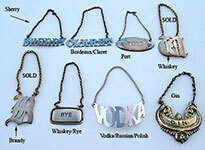 The Whiskey_Rye Label is 'Tiffany' Sterling.